If this train had been moving, it would have been pretty stupid to be standing here taking its photo. But, having crossed the Willamette River on the Albany rail bridge, the train was parked on the track just short of Second Avenue. What an opportunity to take closer look! 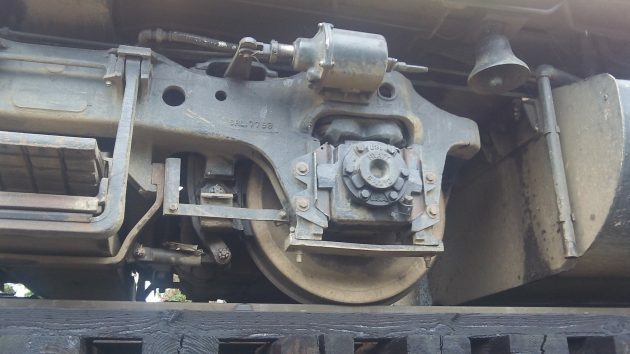 You can get a fairly close view of the underside of these diesel-electric locomotives of the Portland & Western when they are waiting at this point, as the trains on the Toledo District or branch often are when they are coming into Albany. Just why they are waiting there I don’t know. 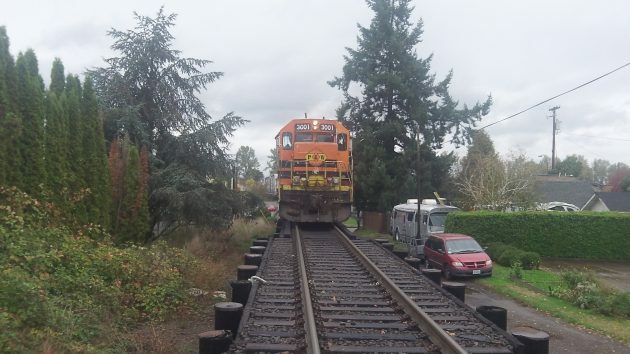 Maybe it’s to get into the Albany yard, for the route going the other way, toward the Millersburg yard, should require no wait since the Santiam Lead was completed, with the state’s help, more than a year ago. Diesel-electric. Still powered by fossil fuel. Just try powering one of these with “green” energy, like solar batteries or the like. 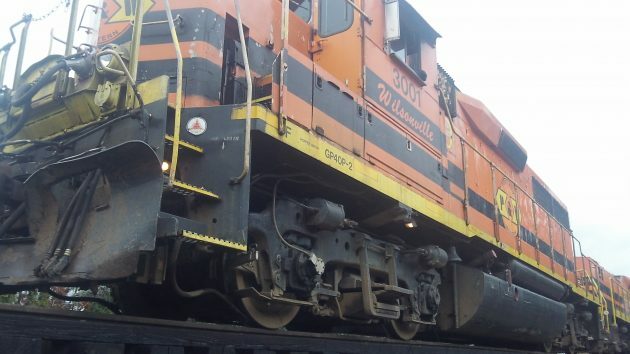 They stop and wait to get the permission of the Union Pacific dispatcher to cross over the UP main into the Albany Yard. I think the dispatcher throws the switch now that the UP mainline is CTC and we lost all the historic ABS signals two years ago. The ABS signals were put in during WWII because of increased wartime traffic. “Centralized traffic control” and “Automatic Block Signal” will get you to the Wikipedia articles for the initials above. One wonders why there is zero progression on the rails. Other countries do it. Speaking of zero ….world’s 1st Zero Emissions train.